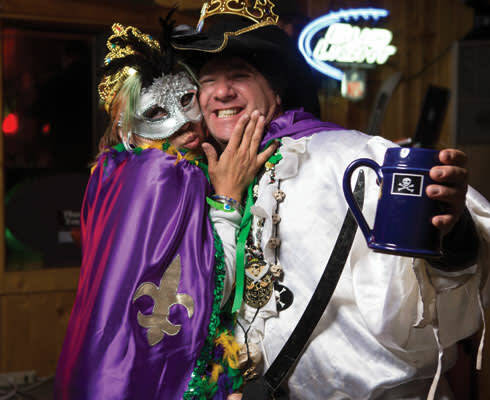 Above: At the Pirate Krewe Ball at the Black Diamond Grill, King Michael Johnstone hoists the grog as Queen Hannah Gadri draws nigh. Wayne Evanson performs with Fritz Davis and Friends at Mountain Treasures Bistro and Gallery. 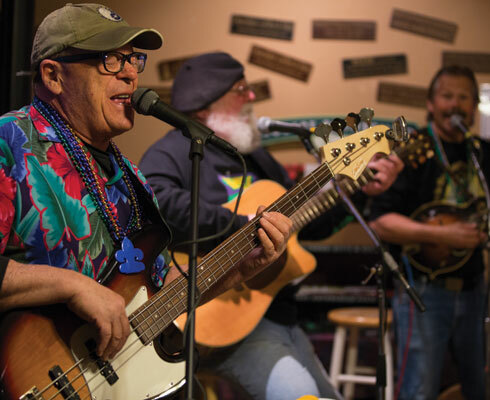 N RED RIVER, we know a good party when we see one," says Fritz Davis, a musician who&apos;s also the editor of this northern New Mexico mountain town&apos;s weekly paper, the Red River Miner. We&apos;re sitting at the Timbers restaurant, on Main, and I’ve ordered a meal that features alligator meat, not known as specialty in these parts. It’s Fat Tuesday, the final day of the weeklong bacchanal known as Mardi Gras in the Mountains, an annual event that has gained Red River a reputation as one of the best ski resort towns in the country for celebrating Carnival. Davis, originally from Wichita, moved to Red River in 1989 and seems to embody the festive spirit of his adopted home. A big man with glasses and a prodigious white beard, he is wearing multiple bead necklaces-Santa Claus meets Bourbon Street. 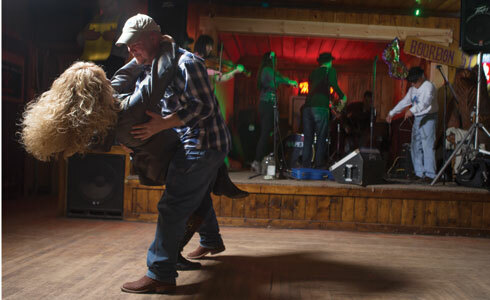 Ryan and Chassidy Wagnon dance to Forest Huval and Bon Temps at the Bull O’ the Woods Saloon. A band called Bon Temps shows up to grab dinner before playing at the Black Diamond Grill for the Pirate Krewe Ball, the grand finale of the nightly parties that began last Thursday. Red River is a music town, and a number of local virtuosos like singer/songwriter Mike Addington have performed over the past few days, but Bon Temps are the guests of honor. They’ve come up from Louisiana, as they’ve done for several years running, to lend acoustic authenticity to this town’s Mardi Gras festivities. “Their music is genuine Cajun, as good as you will ever hear,” Davis tells me as I tuck into my grilled O Rocky Mountain gator, which is unexpectedly tender. ver at the Black Diamond, things are pretty tame, and I wonder if Red River is partied out after five consecutive days of mayhem. A lone middle-aged couple in LSU sweatshirts dances a little too slowly to keep pace with the accordion staccato of Bon Temps, while a man in camo bib overalls drinks at the bar. It’s about what you would expect on a Tuesday night in a mountain town with a population under 500. Things begin to change as partiers in beads start rolling in and taking to the dance floor. Seventy-five-year-old Pope Huval, who plays the triangle for Bon Temps (his grandson Forest is on the accordion), briefly abandons his post and joins in for a little two-stepping with a woman from the crowd. 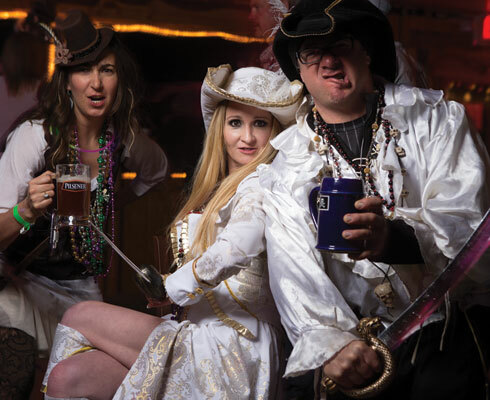 Around 8:30, the Pirate Krewe arrives and there’s an instant influx of buccaneers, wenches, and general swashbuckling revelry. It now takes some effort to get a drink at the bar. I finally succeed, and as I take my first sip of pale ale I’m approached by a man wearing a bicorn hat and frilled shirt. I learn that this is Michael Johnstone, who by day works in marketing for the Angel Fire ski resort. Tonight he is Captain of the Pirate Krewe. Britt Felton, Jessica Ross, and Michael Johnstone at the Pirate Krewe Ball at the Black Diamond Grill. “We are high-altitude pirates, and we are highly active," Johnstone tells me as I scribble his name in my notepad. "We have to hydrate constantly." As I take a few notes the Captain retreats, holding his saber aloft. I reach for my beer glass and realize that its contents have been pillaged. ituated in the Sange de Cristo range of the southern Rockies, Red River was a mining village at the turn of the last century. The industry declined in the early 1900&apos;s and in the 1930&apos;s the town began to focus more on tourism. At over 8,600 feet, Red River could offer Texans and Oklahomans a cool mountain reprieve from their scorching summers, with aspen groves and excellent trout fishing. The ski resort initially opened on December 6, 1941, but the next day’s attack on Pearl Harbor caused it to close down. When it finally reopened in December 1959, many who knew Red River as a summer vacation spot began coming up to work on their parallel turns. “I’ve been coming here since I was six years old, first in summer, then in winter,” says Charlene Burk, from Temple, Texas. Burk’s childhood memories of Red River included her father and his friends dressing up as turkeys for the town’s Fourth of July parade and throwing out Monopoly bills to people on the street. This little burlesque, Burk said, was meant as a send-up of the way Texans would come to town and spend their money. Despite successfully establishing itself as a two-season, family-friendly resort, Red River still had trouble filling the vacation gap that could make winter feel especially long. “Between Christmas and spring break, people wanted to kill each other,” says Fritz Davis. Driving a ’61 Willys station wagon bearing a sign that read ASK ME ABOUT RED RIVER, Dobbs toured Louisiana and spread the word about what it was like to go skiing in New Mexico. He felt an instant connection to the people he met, who he thought would feel right at home in a laissez-faire place like Red River. They brought their most famous holiday with them. The Chamber of Commerce helped stage the first official Mardi Gras in the Mountains in 1992, and the event is now rivaled only by Memorial Day weekend as the busiest time of year in Red River. There’s a children’s ball, costume contests, parades, and a Zozobra-esque opening ritual called the Burning of the Wild Tchoupitoulas. All week long, visitors can sample Cajun-inspired dinner specials at Red River institutions like the Bull O’ the Woods, which went through 700 pounds of crawfish in two days in 2015. Every night, a different krewe stages their own ball and lines stretch down Red River’s main (and more or less only) street. ’m standing in the corner of the Black Diamond Grill, awaiting the coronation of the King and Queen of the Pirate Krewe Ball. With me is a grizzly bear of a man in a black leather vest, bolo tie, and Stetson. He’s a bouncer at Red River’s iconic music venue, the Motherlode Saloon, and he’s been telling me about how this past weekend’s temporal alignment of Mardi Gras, Presidents’ Day, and Valentine’s Day has made for one of the busiest winter weekends in recent memory. This man’s name, I’m somewhat surprised to learn, is Kermit. Young Barron Williams shows off his pirate loot. 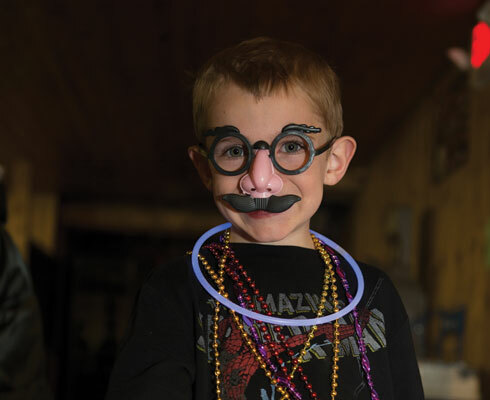 Though the ribaldry of some of the pirate wench gyrations Kermit and I are witnessing on the dance floor may be a little beyond PG, Wally Dobbs insists that, in Red River, “We’re a kid-friendly Mardi Gras.” His comment feels consistent with the overall atmosphere of the town. In the winter after Hurricane Katrina, Red River saw an abnormally large contingent of visitors from Louisiana, as parents wanted to go to a place where they could let their children play freely and not have to worry. will take place from Thursday, February 4, to Fat Tuesday, February 9. Information about the event and lodging in Red River can be found on the Red River Chamber of Commerce website, redriverchamber.org.